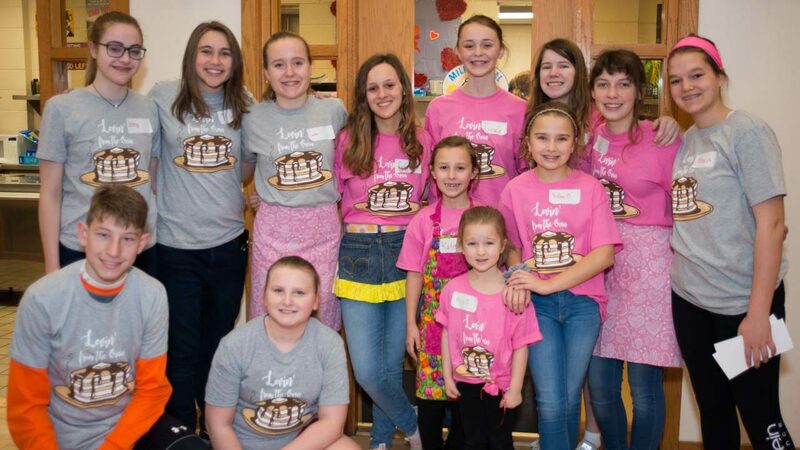 Thank you to all who came to the 9th Annual Lovin’ from the Oven pancake breakfast on Feb. 23! A total of $8,180 was raised for SSM Cardinal Glennon Hospital, bringing the event’s 9-year cumulative donations to over $31,000! It was a beautiful event because of the generous hearts of those who came out to support the cause, and we appreciate everyone who had a hand in its success. If you could not attend the event but still would like to help our students reach their fundraising goal, click here to donate online. This year’s breakfast was hosted by Grace Pund ’19, Claire McBride ’19, Peyton and Mila Spellazza, Emma ’19 and Kate ’24 Larkin, and Sydney Willbrand ’23. Lovin’ from the Oven began nine years ago by the Pund family when now-eighth grader, Grace, was in kindergarten. Grace had the idea to combine her love of pancakes with helping kids, and the first Lovin’ from the Oven charity breakfast was held in the Pund’s home. Grace continued to host her pancake breakfast each year, and in her fifth year, was joined by Emma and Kate Larkin, and Sydney Willbrand (along with their parents); and then Claire McBride and her family in the sixth year. Lovin’ from the Oven is proud to have donated more than $31,000 over the last nine years to SSM Cardinal Glennon on behalf of its generously supportive host families and their pancake-eating friends and families!